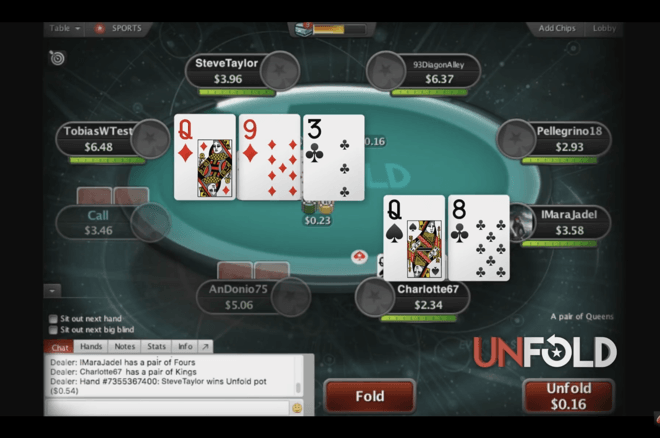 The new Unfold game at PokerStars allows those who folded preflop a chance to keep playing. PokerStars continues to push the envelope with new game variants, and perhaps the strangest hold'em tweak yet has hit the Danish PokerStars client and will presumably go live worldwide in the coming weeks. A couple of weeks after the exit of Showtime Hold'em and a few months after the debut of the first creative twist, Split Hold'em, poker players on the world's leading online poker provider will be getting Unfold. Whereas the previous games PokerStars introduced allowed players the chance to play double-board hold'em and the chance to see folded cards, Unfold gives players the chance to continue playing even if they've mucked their cards. That's the premise of the game. It starts out like normal hold'em, except there's a separate ante — variable, but some amount between 60 and 100 percent of the big blind — that goes into what's called the "unfold pot." After the preflop round, everyone who folded has an option to unfold by putting in a bet matching the size of the unfold pot. Once everyone has made his or her decision, the rest of the hand is played out normally by the players contesting the main pot and there's no more action between the unfolded players. For the latter, it's simply a race to showdown at the end of the hand. If someone wins the main pot before the river is dealt, the board is dealt out anyway to see who wins the unfold pot. So, there are two pots awarded: the main pot between the players who saw the flop as normal and the unfold pot between the players who opted to pay the pot-sized unfold bet after folding preflop. In cases where one or zero players take the unfold option or the main pot is won preflop, everyone gets their unfold antes back. The game is eight-handed and players buy in between 60 and 80 big blinds. According to posters on TwoPlusTwo, contrary to some initial reports, the unfold pot is raked between between five and eight percent. "No more agony watching your hand turn good on the flop," wrote PokerStars' Stephen Bartley. "No more waiting around for the game to get interesting. And no more long spells being card dead. "It's like poker with the benefit of hindsight. Actually it's more than that. It's a lot of fun." Here's a video explanation of the game where you can see how it works in action. The Stars Group owns a majority shareholding in iBus Media. Feel like I've been hit by a bus this morning. Think it is #haggis withdrawal after our Edinburgh trip.